My six month membership at Slimmers World Alabang ended a few days ago, and I honestly don’t think I’ll be renewing. Ever. It’s not that I have anything against the center, I just didnt enjoy my time there. It was cramped, crowded, and limited in terms of equipment and classes. Since my mother in law speaks so fondly of Zumba, I decided to find out where I could take classes too. Lo and behold, Gold’s Alabang offers them, and the schedule suits my daily routine perfectly. The best part about Gold’s is it’s near the house, and I enjoyed being a member there when I was still with Smart. Too bad my schedule back then was not so friendly, and I didn’t really get to maximize the amazingly low corporate rate we used to get. Anyhow, today I was offered a promo rate that was actually too good to resist. I start on Monday. Wish me luck! 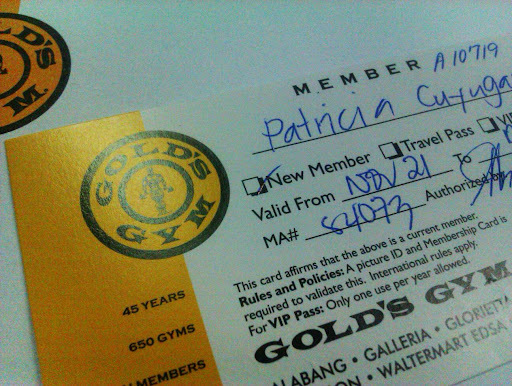 Hi, I know this is a dated post, but I wonder if you pushed through with your gym membership in Gold’s Alabang. I’m thinking about signing up there, but I’m not too sure yet.